← … And we come back next week! Bomber, have you Hird the Knightmare is over? After a dramatic 24 hours at Windy Hill, one thing is certain, all opposition clubs will be once again terrified of the powerful, mighty Essendon Football Club, the most successful football club (along with Carlton) in the history of our great game. The 27th September 2010 started like any other day, yet finished with the possibility of James Hird signing on as Coach and Mark Thompson signing on as Director of Coaching for the 2011 season. The coup, if successful, is huge for Essendon and the return of their last two premiership captains will surely help the once dominant club, return to the top of the ladder within a few years. a) Kevin Sheedy coached the mighty ‘Dons for twenty-seven years and delivered four Premierships from seven Grand Finals, having never had prior experience as an assistant. b) If Mark Thompson is to be appointed Head of Coaching, given his experience he will probably call most of the shots. James Hird is there as a figurehead who will get the respect out of a young playing group. With this, he’ll get the players to play for him and most importantly play for the club, the mighty Red & Black. The intensity will lift, the passion will return. Something that’s been missing for the last three years under Matty Knights. In addition to this, many are comparing Hird coaching Essendon to that of Michael Voss coaching Brisbane, which people are calling a failure. To those people, did you realised Brisbane missed the finals in 2005, 2006, 2007 and 2008? Did you also realise that in Voss’ first season in charge, Brisbane beat Carlton in the 2009 Elimination Final? Those basing their opinions on this season, a season troubled by injuries to key players I might add, have a very short memory. If Voss failed this year due to limited coaching experience in the past, how do you explain 2009, when he had even less experience? And of course, James Hird isn’t Michael Voss and Essendon isn’t Brisbane. You can’t compare apples to oranges. The record under Matty Knights was disgraceful for such a proud, passionate, successful club, having won just 25 of 67 games (37%) while Knights was at the helm. Can it gets worse? Unlikely. One of the most overlooked aspects in football is the ability of a coach to gain 110% effort out of all his players. There’s more to winning games of football than simply having the skill, the mental aspect is half the battle. Hird will get more out of the current crop of players than Knights ever did, because he’ll have the respect, the admiration. The admiration that a champion brings to the club. This sums up the situation with Hird perfectly and highlights the fundamental difference between he and Knights. 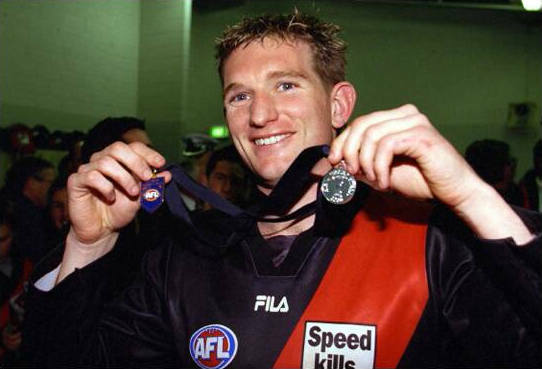 Essendon’s greatest player and one of the games most decorated players of all time is definitely the man to set the example and be the perfect role model to the next generation of Bomber stars, just as Sheedy was to Hird almost twenty years ago. To all the doubters, I’ll be sure to remind you of your words when the decision pays off and Hird’s once again lifting the Premiership Cup, just like he did in 2000. This entry was posted in Football (AFL) and tagged AFL, Coaching, Essendon Football Club, James Hird, Matthew Knights. Bookmark the permalink. Nothing to stick it aint going to be a quick fix which all bombers expect! Clarky, Good article. Just one small spelling error with twenty on the end of the article. (Know you will want it right, that’s all). Like the 1st Chinese quote in there. Goodwin will sign with Adelaide tomorrow Joseph…..
Could it be the best partnership in Bomber History??? Hird said On the Couch tonight that he is assembling the best coaching unit possible. He is not leading the club alone but he will surround himself with the best team possible. And as a unit they will rebuild the club. It will be nothing like Voss in Brisbane! Understand that Hird will be one part of the panel and will be expected to fulfill his role as will all the other coaches. If we get Bomber back the greatest coup in recent memory will be complete. – The club needed Hird, more than Hird, needed the club – We should be grateful that Hird accepted the position. 100% spot on. This will completely lift the spirits of the place. So badly needed after the last year. Let the rebuild of the rebuild begin. It’s still going to be a long way back, but thank god it is now going to start. Very interesting AJ very interesting indeed.